It is said that religion should never be discussed at dinner parties. For a party of Christians, perhaps eschatology would substitute. There is nothing quite like eschatology, a complicated and controversial topic, to ruin potential unity. Conviction and confidence are inadequate; this discussion cannot survive without humility. This needed humility is striking in Dean Davis’ The High King of Heaven. Davis begins, “as fools long to play Hamlet, so I longed to write a short definitive book on biblical eschatology. I blush to present you with the results” (xiii). This is no doubt due to the fact that this sentence appears in a 700+ page book! However, Davis has achieved something quite remarkable here, in that The High King of Heaven is an astoundingly amiable and accessible book on eschatology. A brief outline of Davis’ argument is in order. The High King of Heaven is made up of 25 chapters divided into 5 Parts, concluding with 10 Appendices and indices. Part 1 surveys end-times issues and options (ch 1-4). In Part 2, the Kingdom of God is treated at length from varying angles including the teaching of Jesus (ch 5), God’s eternal plan of salvation (ch 7) and the Old Testament (ch 8). Part 3 carefully examines Old Testament Kingdom Prophecy and not only how it is used by the NT, but also in its own context in books such as Isaiah, Jeremiah, Psalms, Ezekiel, Daniel and Zechariah. Part 4 is all about Revelation, particularly the Millennium in Rev 20. Finally, Part 5 surveys how the NT presents the consummation of all things. Appendices include critiques of Historic Premillennialism (#1), Postmillennialism (#2), Dispensational Premillennialism (#3), and Preterism (#4); a discussion on the modern state of Israel (#5); helpful lists of relevant eschatological texts (#6-9); and selections from the creeds on the consummation (#10). The High King of Heaven has many virtues, all beginning with ‘c’. First is charity. Commonly, these debates to take an argumentative or polemic turn, but I doubt Davis would lose any readers due to his tone. One will find frequent lines like “our postmillennial brethren” (p622) or references to dispensational convictions as “reasonable and commendable” (p15). Davis seems like a guy who is forcefully persuasive, but with a smile! A friendly personality leaps off the page. Second, is clarity. I was immediately struck by just how understandable Davis has managed to make such complicated concepts. This is mostly found in his prose, which is warm, eloquent and patient. Explanatory tables and charts and Davis’ own summary terms are also very helpful. An example of the latter would be “OTKP”, which stands for “Old Testament Kingdom Prophecy”; that is, any Old Testament passage that envisages the future glorious age. Another example would be “NCH”, which stands for the “New Covenant Hermeneutic”. 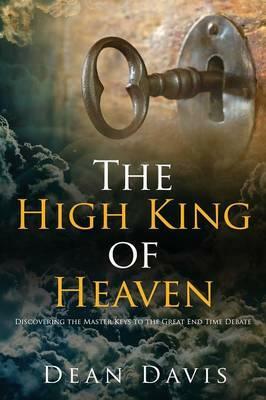 It seems to me that any believer could pick up The High King of Heaven and follow along with Davis. The third virtue is the book’s comprehensiveness. Whether it’s treatment of every important NT eschatological passage, his ten (!) appendices, or – especially welcome – his thorough discussion of Old Testament eschatological passages, Davis leaves virtually no stone unturned! Additionally, as a feature that is always beneficial, the Scripture index has formatted in bold any page number where a particular passage is treated in depth. However, I also perceive three weaknesses to The High King of Heaven, beginning with ‘l’. First, counterbalancing the clarity is a frequent long-windedness. Davis is inclined to explain himself carefully, but for some this will become dull and repetitive. Entire paragraphs could have been summarised into one or two sentences. I am not saying that Davis rambles; everything in this book is relevant and well laid out. However, at times virtually hundreds of pages discuss issues that are important, but ultimately peripheral. For example, the Understanding the Kingdom of God is unpacked in 7 chapters over 100 pages. Davis himself admits that rather than going directly to “the next logical step in our journey” (p69), he takes a “rather circuitous route to our destination”, which, though longer, is a “more fruitful journey” (p70). Though this scenic route was more exhaustive, I found myself more exhausted. Second, and related, the book’s length counterbalances the comprehensiveness. Though appealingly formatted with numerous headings and sub-headings, I am sure many hesitate even opening the book due to its size. This would be unfortunate, but understandable. Third, and my most significant issue is the logic of Davis’ “keys”. Davis begins with principles drawn from Jesus’ own teaching and then applies these principles to the Old Testament. For Davis, these principles, known as the New Covenant Hermeneutic (NCH), are “four great truths that open all doors and solve all problems” (p177). This approach of beginning with Jesus is certainly commendable; where better to begin than with Jesus? What’s more, the NCH is easy to grasp and apply to navigate the overwhelming maze of eschatological texts. However, skeptics to Amillennialism will most likely have the distinct feeling that Davis is stacking the deck. Rather than being given ‘keys to unlock any door’, some will see instead a ‘hammer that opens any window’. As a striking example, Ezekiel 37’s imagery of the regathering of Israel and Judah in the land becomes for “Christian interpreters ruled by the NCH” a “‘mysterious’ picture of the ingathering and upbuilding of Christ’s New Covenant people – the church” (p314). And what of their return to the ‘land’? The “new land” becomes either heaven, or possibly “‘the [spiritual] region of which Christ is King and Lord” (p314). What of Ezekiel’s imagery of the two sticks of Judah and Israel being joined together (Ezek 37:16ff)? This is somehow a “very subtle picture” of Christ’s cross (p316)! Many will stomach this, but others will be left with a rotten taste in their mouth from the apparent “great fruitfulness of the NCH” (p316). For them, this will exemplify the usual criticism of Amillennilasm: it “spiritualizes” the text to such a degree that it becomes nearly unrecognizable. A comprehensive book on eschatology must choose an approach, and Davis’ New Covenant Hermeneutic has its clear strengths, particularly its intelligibility and accessibility to any Christian. However, I have found a more inductive Amillennial approach – one that carefully traces intertextual development of OTKP texts and themes – to be more compelling, as it is harder to argue against Scripture rather than a principle. However, this would result in a very different and more rigorous book, a thereby restricting it to a more selective audience. The High King of Heaven unabashedly argues for Amillennialism, and as such is not intended to be an impartial introduction to eschatology. However, this should not dissuade interested readers. One need not agree with everything Davis says to benefit from this work; in fact, I expect even many Amillennarians will disagree with his take on some passages, such as Daniel 9:24-27. However, one would be hard pressed to find a more charitable, clear and comprehensive presentation of Amillennialism. It also serves nicely as a resource for later use. I could certainly recommend The High King of Heaven to any Christian who is keen enough and patient enough to wade through its many pages to read a defense of Amillennialism. For a reader with less interest and/or time on their hands, I would look elsewhere, perhaps Riddlebarger’s A Case for Amillennialism. For a more academic reader interested in getting their elbows dirty through thorough exegesis, I would suggest other works such as Storms’ Kingdom Come or especially Menn’s Biblical Eschatology. As I’ve only read Storm’s work, these recommendations come on very general knowledge of the books’ contents. Davis is working on a condensed introduction to Amillennialism, which I expect will resolve my critiques of the book’s long-windedness and length! And then interested readers can track down copies of The High King of Heaven to impress others at dinner parties. I was personally and graciously asked by Dean Davis to review this book. I have tried to review it on its own merits as a representation of Amillennialism. Reviewing this book does not mean I hold Davis’ conclusions. Is Mark 13 About Only The Second Coming?